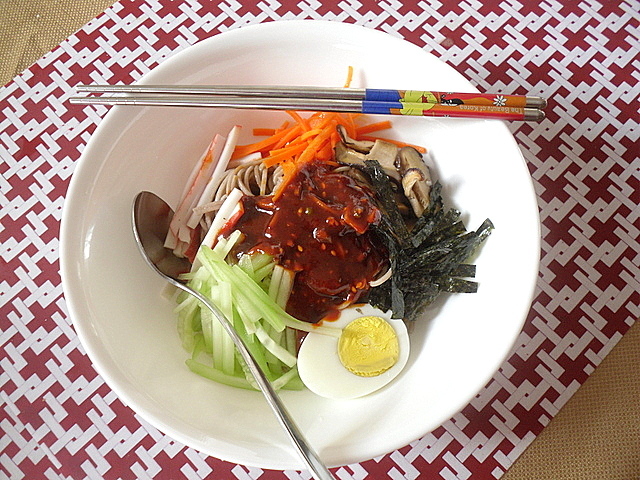 Bibim naengmyun or Korean mixed spicy cold noodle is so economical to cook at home. Furthermore, we can add whatever ingredients we like. The one sold in the restaurant mostly has cucumber, radish and boiled egg and they charge $9 for a bowl. I would rather spend my $9 on some chicken/meat and side dishes. A plus is this cold noodle dish is so easy to make and I calculated the cost to be less than $6 for 2 bowls. 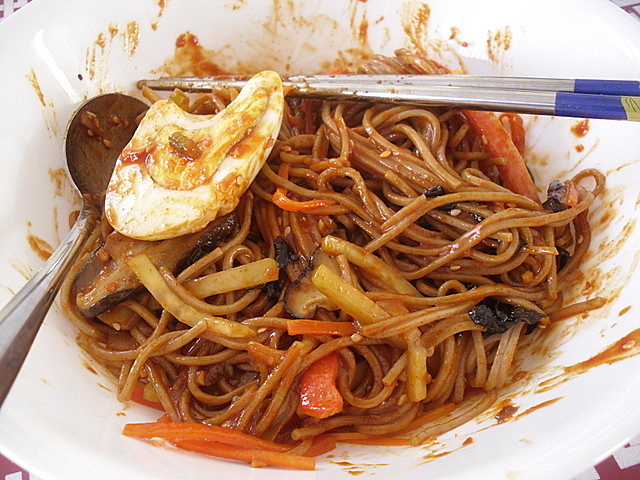 If you have a craving for spicy mixed cold noodle, why not make it yourself? One thing though, you got to be able to take the heat, as this is a SPICY noodle dish. 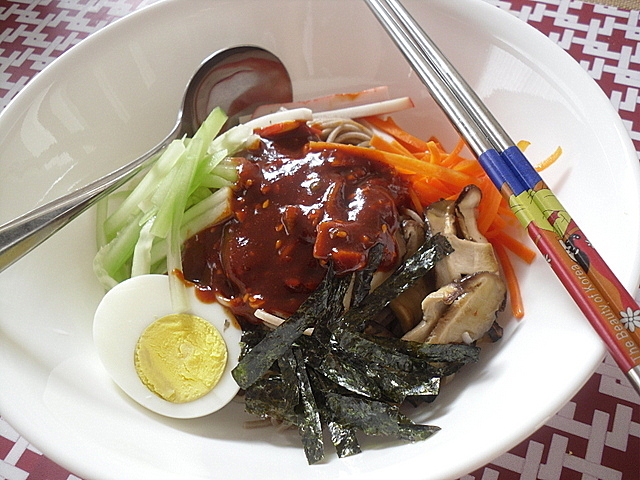 Those that cannot take spicy food, can try the naengmyeon, is a cold noodle dish serves in cold radish kimchi broth or clear beef broth (with crushed ice), suitable for hot summer days. 1. Prepare and slice all the ingredients. 2. Heat up a non-stick pan, add a little oil and pan-fry the carrot for a little while, dish out and set aside. In the same pan, add in the mushrooms. 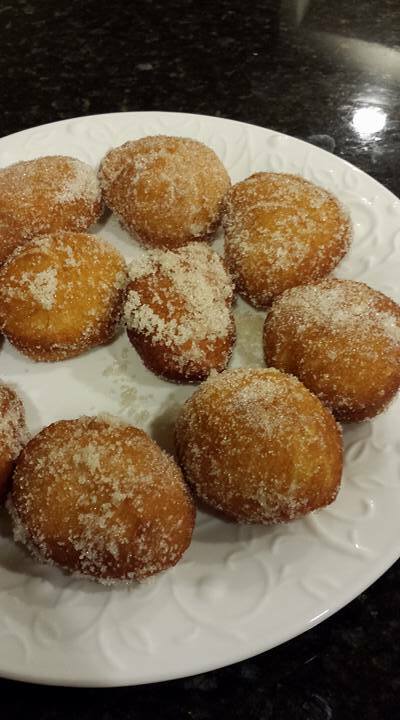 Pan-fry without adding any oil until the mushrooms soften and juices come out, season with a little soy sauce. Dish out and set aside. 3. Prepare the spicy sauce in a bowl. Mix all the ingredients together to make a thick sauce. 4. Boil the buckwheat noodle per package instruction. Set aside. 5. 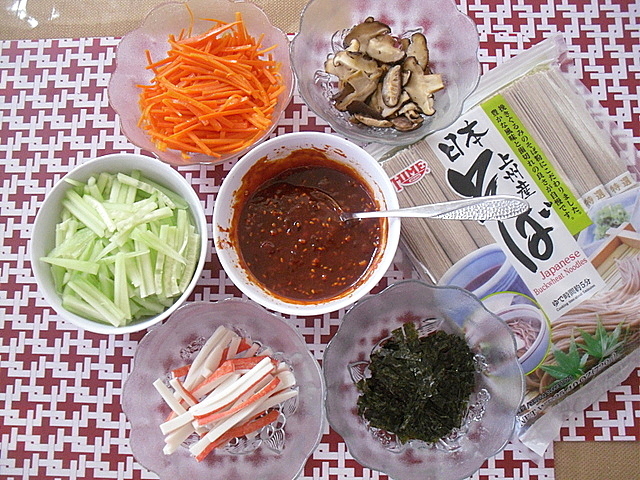 In a serving bowl, add in some noodle, arrange the cucumber, carrot, mushroom, imitation crab meat, pickled radish and carrot (not shown), seaweed, boiled egg around the noodle. Add the spicy sauce in the middle to serve. Mix well and enjoy! Oo - there is always time for spicy noodles! 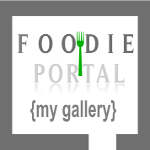 Now I need to get good quality gochujang - can you recommend the brand? The one I usually see in the Korean supermarket seem to have MSG, and 1-2 preservatives and v high sodium level. So I usually never buy. I think most Gochujang comes with MSG, corn syrup and high sodium level. The one I bought doesn't have preservative though. I can't recommend you the brand because I can't read Korean. It's all written in Korean words except red pepper sauce and keep refrigerated after opening. hahaha.... In that case, you just read the ingredient list and compare all to pick one that is suitable for you. But I think all have the three things I listed above. Also, buy one that is made in Korea, at least in that case, the corn syrup might not be GMO. This spicy noodle is perfect for the warm weather...I love the flavors in it. Where can I buy the buckwheat noddle in Singapore? Same with cold noddle from Daiso? Thanks. Hi Ma Wai, I think is the same thing, like soba noodle. 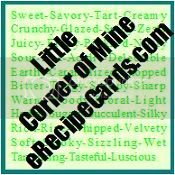 Check the ingredient list and see what is it made of.